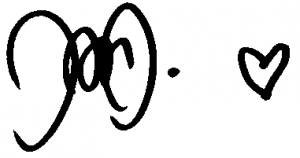 I’ve started writing this blog for several reasons. Firstly for the pure love for writing about and sharing yoga anatomy. Secondly I wanted explain why at Ihana Yoga we choose to ignore some common alignment cueing and use very different and often opposing cueing than the prevailing consensus. And thirdly I hope to create a ripple effect in yoga alignment cueing and to raise the bar of yoga teaching standards. With these blog posts I wish to highlight that our cueing is a matter of anatomy not a specific style we follow. So with that in mind, this week’s blog post is all about improving posture and learning to set the shoulder blades to find a neutral scapula position. As the common posture is rounded in the upper back and shoulders, we aim to use yoga in a therapeutic way to correct and improve posture. The pictures below show how shoulders commonly hang too far forward and down (downward rotation and anterior tilt of the scapula). This type of shoulder position limits natural arm movements and in your yoga practice you might not feel as strong in certain movements when you initiate the arm movement from droopy shoulders. 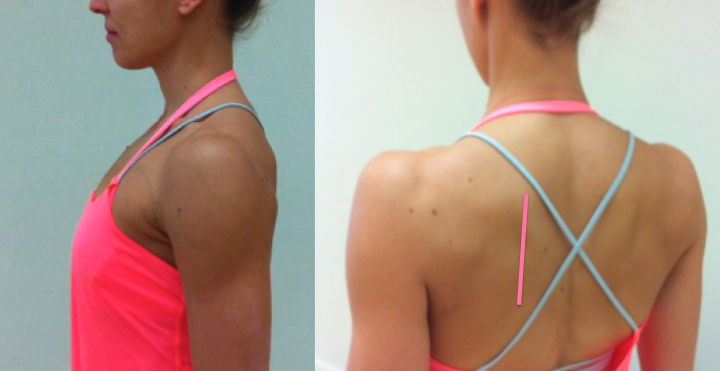 Setting the shoulder blades is the single most important shoulder trick/alignment to learn and to do before every pose. To correct the excessive downward rotation of the scapula, we need to strengthen the upper and lower trapezius (the muscles that upwardly rotates the scapula) to hold the shoulders slightly higher than what we’re used to. Focus on the outer most tip of the shoulder and very slightly lift it up. To correct the excessive anterior tilt of the scapula, we need to strengthen mainly serratus anterior to hold the shoulders slightly further back and flat on the ribcage. You can combine the movements and after the lift slightly move the tip of the shoulder back. Do one shoulder at a time, so that you learn this movement without pulling the shoulder blades together. As a strengthening exercise you can hold the position for 5 breaths and then relax. Repeat as many times as you comfortably can, but as soon as the muscles start fatiguing, it’s time to stop. However, if 20 repetitions feel really easy, you can add on a ½kg weight. Holding a small drink bottle in your hand, allow the arm to stay straight down by the side and repeat the lift only from the shoulder. Again max 20 repetitions. If in yoga class you’ve been asked to ‘soften the shoulders’ or more precisely ‘relax the top of the shoulder’ especially when the arms are lifted over the head, these awfully common alignment cues are asking to relax the upper traps and switch off the prime mover of upward rotation. Why don’t we want to switch of the prime mover? It would be like removing the chain from your pushbike before going on a ride. As a result the shoulder blades should look more upright resting flat on the upper back, and the general frame of the shoulders should look stronger and less rounded. In an optimal scapula resting position, the inferior angle of the scapula is slightly lateral to the superior angle. The scapulae should be relatively flush with the ribcage and positioned between the 2nd and 7th thoracic vertebrae (the bottom tip roughly on the bra line). Before the sun salutations or any static pose, stand in Mountain Pose and set the shoulder blades. To make sure that you didn’t use rhomboids between the shoulder blades, take a deep breath into your upper back and see whether you still have freedom of expansive movement or whether the shoulder blades are drawn together. Recruiting the rhomboids would be counter-productive, as they downwardly rotate the scapula and give a military like chest lift and close the back of the heart. This doesn’t allow the breath to move freely along the spine. 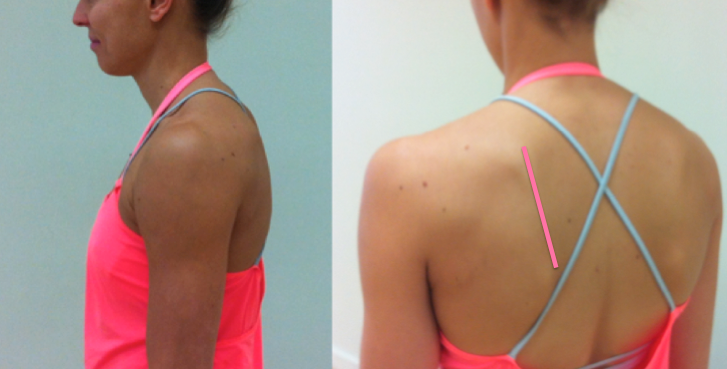 The image below shows a strong retraction, but even pulling the shoulders slightly in and down recruits the wrong muscles for a neutral scapula. I hope this blog post gave some clarity to why we don’t use the common cue ‘pull the shoulders in and down’ to set the shoulder blades in Mountain Pose. Now take a moment to set your shoulder blades, take a deep breath to your upper back and enjoy your improved posture.